DiscreteHeat in News - DiscreteHeat Co. Ltd.
A study carried out by the Mackintosh School of Architecture found that many homes had too much moisture indoors. Up to a third of this moisture was attributed to drying laundry. 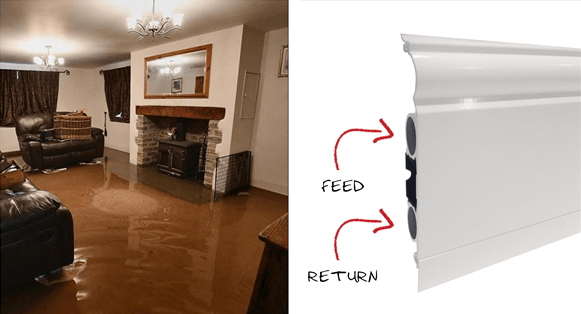 With recent weather events hitting the headlines, thoughts have turned from cleaning to rebuilding and renovating those properties devastated by flood water. With thousands of homes under several feet of water, there is much work to be done. The Government has indicated it will look again at the UK’s flood defences and warning system, but tacitly admits there is precious little it can do to prevent these so called one-in-a-hundred-year floods happening ever year. THERMASKIRT from DiscreteHeat Co. Ltd. is described as "a stylish, practical and energy efficient alternative to radiators and underfloor heating". 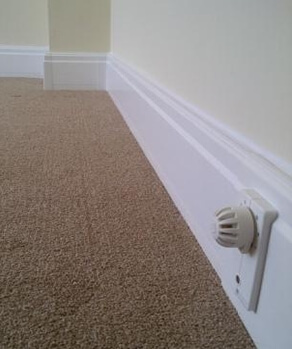 Designed to look like skirting board, ThermaSkirt radiates heat from warm water passing through pipes that are moulded into the back of the skirting moulding. 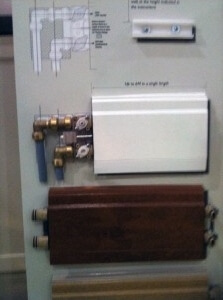 ThermaSkirt works with traditional boilers and also with renewables such as heat pumps. 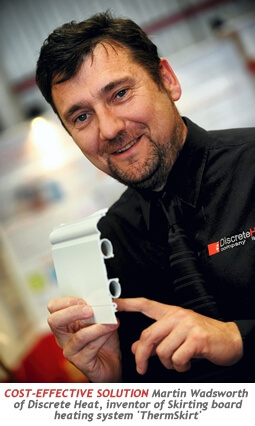 DiscreteHeat explained: "Each section of ThermaSkirt panel is joined in the corners with patented push-fit connectors (no soldering or sealants) and then hidden by a complementary colour matched cover". Thankfully, we live in an era where houses can be warm, even in the deep mid-winter. A recent survey discovered that the average thermostat is turned up to 23 degrees, which is warmer than a summer’s day. One in 20 of us has it at a tropical 30 degrees. 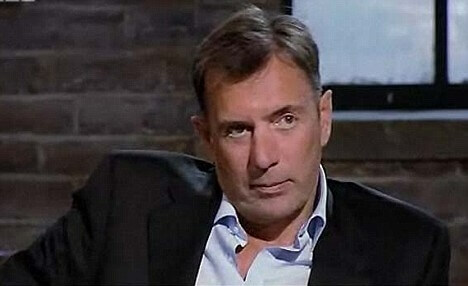 But beauty-wise, central heating is doing us no favours. Ever wondered why hair is lifeless and dull and skin sallow and dry from October to March? Being a fully sealed, wipe-down profile, cleaning and maintenance of the system is easily managed. ThermaSkirt delivers a radiant heat, so there are no drafts or hot/cold spots - eliminating the dust and particles that conventional systems move around by air movement, which can exacerbate any respiratory conditions or spread bugs and germs. 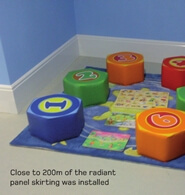 Radiant skirting replaces the skirting boards and radiators in one – often utilising the existing plumbing. 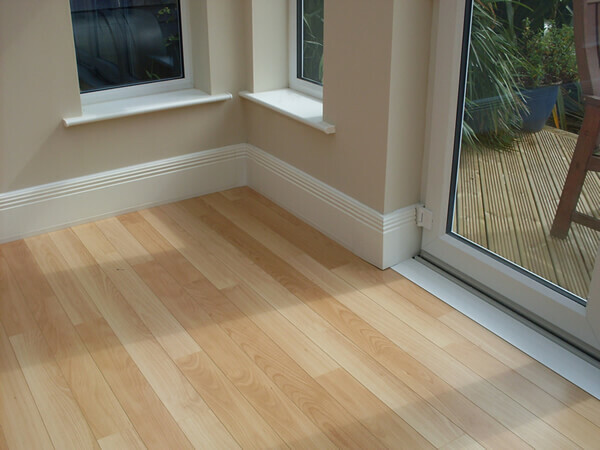 Skirting boards have a large surface area which is perfect for emitting heat at a low flow temperature to heat rooms. The fact that ThermaSkirt also heats the occupied space from a low level and from all sides means that it creates the even heat that under floor heating aims to achieve. Many homeowners agree that it is the evenness of the heating that helps to maximise comfort levels (although this is currently not a factor in SAP or heat loss calculations) and helps to maximise energy efficiency. Eliminating conventional radiators as the main remaining source of the spread of Healthcare Associated Infections (HCAI’s) would offer considerable savings for the NHS and also provide a significant improvement in patient care. HCAI’s are estimated to cost the NHS an incredible £1 billion a year and the cost of correctly cleaning radiators in accordance with hospital guidelines adds another £500 million to the bill. ThermaSkirt is 13 per cent more energy-efficient than conventional radiators and up to 25 per cent more energy-efficient when used with right heat source. The disruption and cost associated with that makes it not practical. ThermaSkirt is a much more cost-effective solution. ThermaSkirt is appealing to people who want to cut their green house gas emissions, save money and also have a heating system which doesn't intrude into their homes. 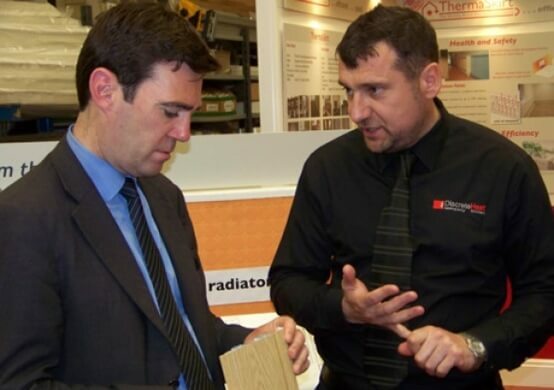 A company that has developed a more efficient way to heat buildings is set to capitalise on a new government scheme designed to get more green technology in homes. 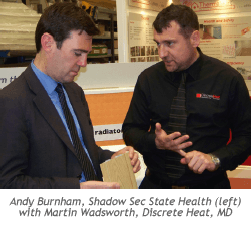 Atherton-based Discrete Heat is the company behind ThermaSkirt, which transmits heat through skirting boards rather than via radiators. It proudly claims that the patented ThermaSkirt heating system is more effective than traditional radiator systems when used with new renewable heating technologies such as solar panels and ground source heat pumps, which use pipes underground to extract heat from the earth. The ThermaSkirt works by replacing radiators and skirting boards with a panel which radiates heat and can be wiped clean with a standard floor mop. The company believe using ThermaSkirt in hospitals could save millions of pounds and significantly cut rates of ‘superbugs’ and other diseases found within hospitals, as they say some of the bacteria that cause these conditions are often found in radiators. 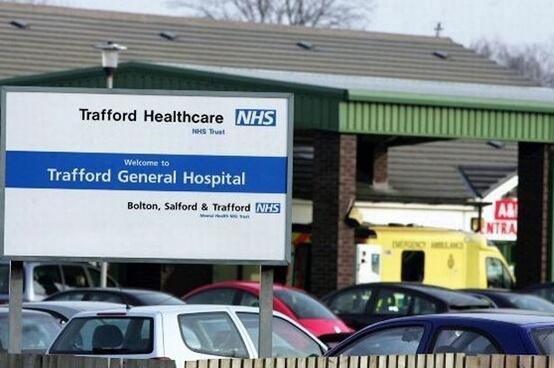 Some hospitals in the region, such as Trafford General, have already adopted the new heating system, but DiscreteHeat want ThermaSkirt to eventually become the standard choice for hospitals across the country. 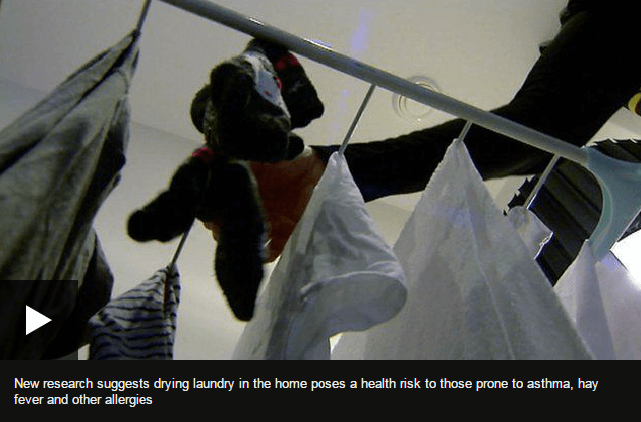 Controlling hospital infections such as salmonella and E.coli must be a priority, say experts. Health Protection Agency data gives a snapshot of infection rates and antibiotic use by NHS hospitals in England in the autumn of 2011. The total prevalence of healthcare-associated infections (HCAIs) decreased from 8.2% in 2006 to 6.4% in 2011. But much of this decrease was due to lower rates of MRSA and C. difficile - infections that the government has repeatedly targeted with policies. 1,000 days with no MRSA makes Trafford General Hospital the best in England. Trafford Healthcare NHS Trust has transformed the way it operates to ensure patients are not exposed to infection from themselves or other people. Bosses put part of their success down to training staff to treat patients without touching key parts of instruments which come into contact with skin. Patients are advised not to touch their wounds and to wash their hands before every meal and after visiting the lavatory. Staff and visitors are also asked to wash their hands regularly. Mark Edwards has become more than just an eco fan. It began when he became frustrated by the soaring fuel bills in his draughty Georgian house in the village of Shrawley in Worcestershire, weary of piling on the extra jumpers. Mark and his wife Lucy felt fuel-poor. Their eldest son Jacob joined his school's eco-action committee and urged his parents to think green. 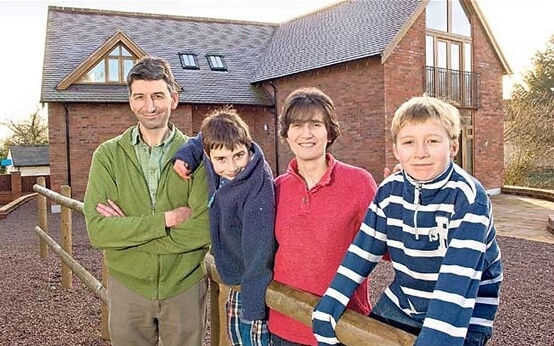 The family, including younger son Nathaniel, lit upon the idea of building a new eco house in the garden which would incorporate all the latest green technology. When Mark decided to go ahead with his ThermaSkirt installation, it was a bit of a step into the unknown. Low and behold, he was left pleasantly surprised at the sheer amount of added benefits it had to offer. The stylish ThermaSkirt skirting board was barely distinguishable from regular wooden skirting, but it hid a secret. 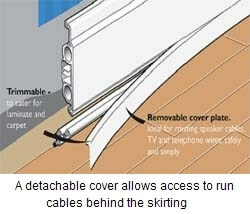 The skirting is made of aluminium and has two oval channels in the back. These channels are a flow and return to the central heating system, so the ThermaSkirt delivers the heat to the room in an efficient and unobtrusive way. 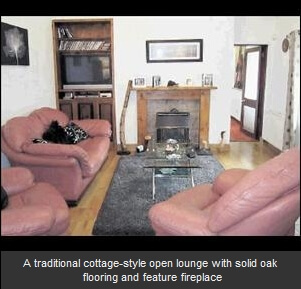 ALTHOUGH Meadowvale is located in the heart of Aberdeen, the cute cottage offers a real rural feel. Indeed, this fact was the main reason the owners Wendy and Matthew Garrett bought the house 12 years ago. After travelling for over a year, the couple got married and settled down. After selling their respective flats, they began to look for a place they could both call home. As a renewable energy company, SwanSolar are always looking for new and innovative products which can be used to benefit both your pocket and the environment. They have recently added a new range of products to their portfolio - ThermaSkirt - an energy efficient room heating device which has space, energy and cost saving potential and contributes to reducing your carbon footprint. Following a request from a client who wanted a new eco heating system to replace their existing electrical wall heaters and electric domestic hot water heater, SwanSolar designed a system to suit both their needs and their finances. The obvious solution for the hot water heating was a solar thermal system as there is no cheaper or cleaner way to heat domestic hot water. ThermaSkirt won a major contract with national chain Plumbase, has been exported to countries as diverse as Iran, Russia and Turkey and is on test with the NHS. Now: Creator Martin Wadsworth, 45, from Manchester, landed a contract worth £4 million and has gone on to work with some of the largest housing associations in Europe. It is rare to find someone who truly loves their radiators. At best they are functional and relatively discrete, at worst they are ugly monstrosities despoiling your walls with their very presence. The other problem with radiators is that they don't work very well with alternative fuels. This is because most radiators are designed to work with water at about 80°C, while most 'alternative' fuels tend to work best at about 35-40°C. You can of course 'up-size' your radiators (run much bigger radiators at much cooler temperatures) but at this point 'discrete' goes out of the window and 'ugly monstrosity' starts to loom into view. A DRAGON'S DEN reject who went on to capture a number of multi-million pound contracts was in Belfast yesterday to see how his 'failed' ThermaSkirt product became a massive hit with the public in Northern Ireland. Martin Wadsworth was opening Tri-Power Environmental Energy's new interactive showroom at Westbank Business Park. 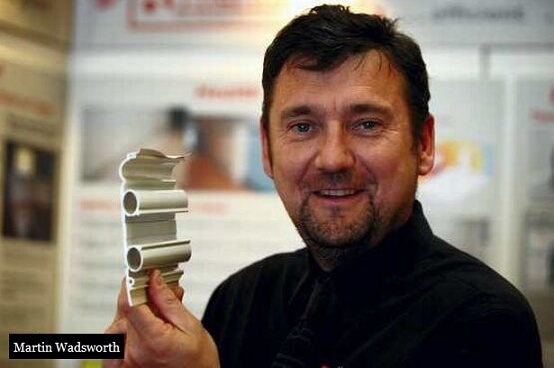 When the entrepreneur appeared on the BBC2 show in 2008, he was rounded on by the Dragons after asking for £150,000 for a 10 per cent stake in his company DiscreteHeat, which manufactures "ThermaSkirt" - a radiator that looks exactly like a skirting board.